Are you flying to Geneva Airport for your next ski holiday? Go directly to the Alps! Geneva Airport is a fantastic Airport to choose, which is very easy to navigate even at busy times, offering almost direct access to the French Alps. 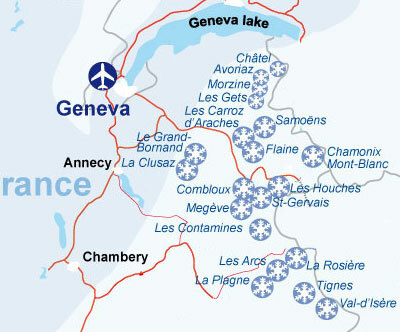 There are numerous options for flying to Geneva from the UK. Regular flights from large and small airlines, such as British Airways and Jet2, fly from both major and regional airports. See below for more information. Below is a list of airline examples flying to and from Geneva, including flights from both major and regional UK airports. British Airways | Flights to Geneva from Edinburgh, Manchester, Gatwick, Heathrow, London City, Glasgow, Newcastle, Aberdeen, Belfast, Jersey, Stornoway, Shetland islands, Tiree and Wick. easyJet | Flights to Geneva from Luton, Gatwick, Stansted, Liverpool, Newcastle, Bristol, Bournemouth, Birmingham. Edinburgh, Glasgow, Belfast, Manchester and Leeds. Norwegian Air | Flights to Geneva from Gatwick and Dublin. Lufthansa | Flights to Geneva from Aberdeen, Belfast, Birmingham, Edinburgh, Glasgow, London, Manchester, Newcastle, Dublin and Shannon. Swiss | Flights to Geneva from Heathrow and London City. Aer Lingus | Flights to Geneva from Dublin and Cork. Air France | Flights to Geneva via Paris. Flybe | Flights to Geneva from Aberdeen, Belfast, Birmingham, Southampton, Newcastle, Exeter, Isle of Man, Guernsey and Jersey. Jet2.com | Flights to Geneva from Manchester, Leeds, Belfast, Edinburgh and East Midlands. Blue Islands | Flights to Geneva from Jersey and Guernsey. A full list can be found on Geneva Airport’s website here (opens in a new window).